Whence Politeness? | "Northern Crossings"
There is a certain amount of handwringing that is going on among some folks as to whatever happened to politeness? Of course the folks whose memories go back as far as their last birthday think that rudeness and a loss of civility started with a certain presidential candidate who said bad things about other candidates and just destroyed the wonderful civil discourse that had taken place in the previous 30 or so years. They don’t remember Reagan being called a dunce and a murderer who wanted to kill homeless people. They don’t remember the Bushes being called warmongers and baby killers by the same folks that believe that Planned Parenthood is the most important NGO in the world, and they don’t seem to remember the vitriol poured out upon Nixon from a tribal memory of him calling Helen Gahagan Douglas the “Pink Lady”. Never mind that John Kennedy donated money to Nixon because he thought she was a pink lady too. If I have to explain the idea of “Pink Lady” to you, you should probably stop reading now. We are getting to the point in our society that explaining that Douglas starred in a movie in which she was so malevolent that Walt Disney used her as the model for the wicked queen in “Snow White and the Seven Dwarfs”, and that the catch line in the movie “she who must be obeyed”; became the mantra of many a husband back in the day is probably more interesting than the fact that Nixon’s campaign against her was considered impolite and never forgotten and in the end led to his downfall. “WaterGate” was about many things but foremost among them was the atavistic hatred that he inspired from that fascinating campaign in which he painted an actress with a pink brush. Political parties never forget a slight unless they are the ones that offer the slight. They forget the slights that they give to one another when vying in elections. Few remember that members of the Democrat party called John Kennedy “bog Irish” and his father a closet Nazi sympathizer which is unfair because Joe was out of the closet for a long time. Few remember that a huge democrat and a big pink lady herself, Eleanor Roosevelt said that JFK should have “less profile and more courage”. See, right there in that last line all the issues that beset any kind of clear discussion of topics and events comes unglued. We live in a world where people having the impolite reactions and issues probably don’t know that Kennedy supposedly wrote a book called “Profiles in Courage”. Back then it was impolite to notice that one of Kennedy’s entourage was openly believed to have written the book and Kennedy took the authorship and got a Pulitzer for it. It is like Obama getting a Noble prize for something before he had done anything. Sorry for noticing – that is impolite. 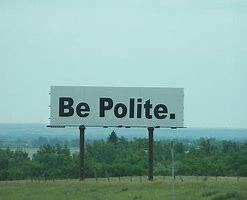 Anyway the average guy in the street wants civility especially if it benefits his favorites. I remember trying to put the best construction on everything when Bill Clinton was elected and when someone asked me what I thought of the election I said that we had elected Eddie Haskell to the highest office in the land and I was sure that his mother was very proud. That was back in the day when people had some sense of humor but even that received a sneer of anger. It was also a time when folks knew who Eddie Haskell was. Apropos of nothing check out Eddie Haskell today and he looks remarkably like Bill Clinton. Or Bill Clinton looks remarkably like Eddie Haskell. The fact is that Clinton’s politeness and faux empathy hid an impolite and rather nasty operative who explained that he signed a handicapped care act from Congress because he “didn’t want a thousand angry cripples chaining themselves to the White House fence.” Maybe that is where we get the idea that fencing is “immoral”. I can hear folks starting to wonder what this is all about. This is a prolix and discursive blog and where is it going? What is this about? This is a mercy blog and one of the attributes of mercy is that it bears things and tries to put the best construction on everything. The 8th Commandment recognizes that language can be weaponized and the words we use can literally destroy. God will hold us accountable for every careless word that we utter. Jesus is the Word and words must be used to describe what He is and what He does. Jesus cares about words. Words mean things and Jesus can be impolite in His language too. What we forget is that He is the Christ and He can speak as He wants. We are not given that luxury. The twisting of words to make politics religious and religion political even as we seek to ignore true religion is damnable and it takes place everyday. To take the merciful language of Christ and scripture and twist the content and context into immoral decisions and power politics is bad business. language has to be cared for and remediated. We are going to take some time to try and understand how the use and abuse of words can change an entire culture and be destructive of faith. What words do to mercy when definitions and uses are changes is incredible. Think of the controversy over calling a wall “immoral”. There is the whole issue of the abuse of language and the weaponizing of words on grand display. More later.